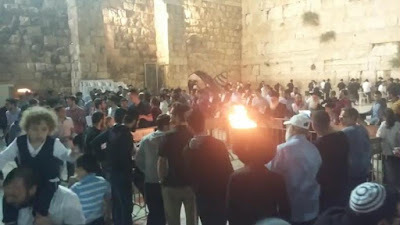 Today is Lag B'Omer, the thirty-third day of the countdown of 49 days from Pesach to Shavuot, a day that is celebrated in Israel as it is nowhere else. And in Israel, the celebrations in the northern town of Meron are the most elaborate of all. In previous years we posted video clips from the great celebrations in Meron. Today we're sharing a video that was taken just last night during the bonfire lighting, singing, and dancing at the Western Wall (Kotel) plaza in Jerusalem.